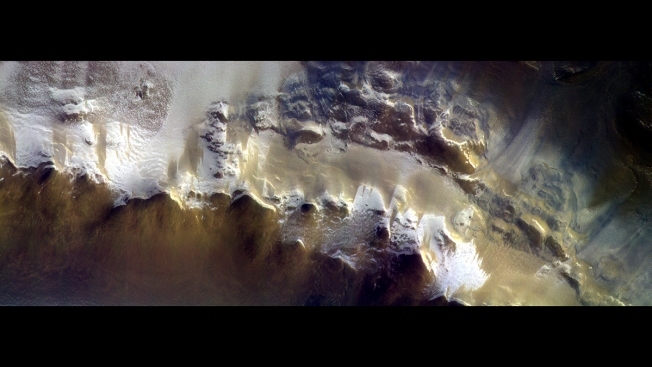 In this image provided by the European Space Agency, ESA, The ExoMars Colour and Stereo Surface Imaging System, CaSSIS, captured this view of the rim of Korolev crater (73.3ºN/165.9ºE) on 15 April 2018. The European Space Agency has released its first image taken by a probe orbiting Mars, showing the ice-covered edge of a vast crater. Scientists combined three pictures taken by the Trace Gas Orbiter’s camera instrument, CaSSIS, from an altitude of 400 kilometers (249 miles) on April 15. The European Space Agency used its Trace Gas Orbiter to take photos of Mars' Korolev Crater. The orbiter's camera will allow scientists to inspect areas where gases are found and help scout Mars for future landing sites. Europe plans to land its own rover on Mars in 2021. The European Space Agency has released the first image taken by its Trace Gas Orbiter showing the ice-covered edge of a vast Martian crater. Scientists combined three pictures of the Korolev Crater taken from an altitude of 400 kilometers (249 miles) on April 15. 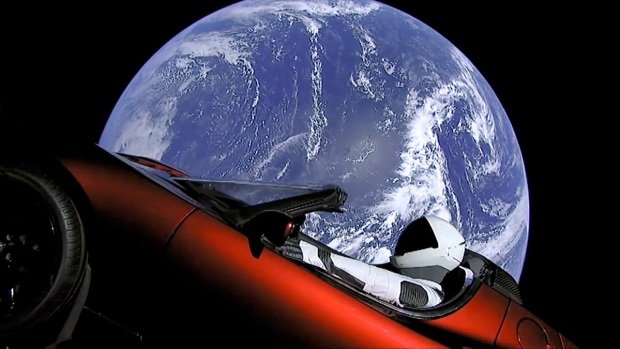 Lead researcher Nicolas Thomas said Thursday the colors in the resulting image were also adjusted to best resemble those visible to the human eye. The camera used is one of four instruments on board the orbiter, which is designed to look for gases such as methane that could indicate biological or geological activity on Mars. The orbiter begins its mission to look for the trace gases this month. Thomas said the camera will allow scientists to inspect areas where gases are found, monitor Mars for signs of change and help scout the planet for future landing sites. Europe plans to land its own rover on Mars in 2021. A European test lander crashed on the surface of Mars in 2016.